"Sampath Speaking" - the thoughts of an Insurer from Thiruvallikkeni: Stallions ~ race, breeding and pedigree !! Even for those who get lured to horses racing, it would be a different kind out there – Gallops of Morocca, is a desert endurance challenge where riders of the globe battle gusts of sandy wind struggling to control feisty stallions. Morocco, officially the Kingdom of Morocco is a unitary sovereign state located in the Maghreb region of North Africa. It is the one of the native homelands of the indigenous Berber people, and has a lengthy coastline along the Atlantic Ocean and Mediterranean Sea.In a country with an ancient history of horsemanship, the event in the wilderness of Merzouga was the first of its kind -- a six-day test of stamina, navigation and teamwork. Competitors spend four to seven hours a day in the saddle, covering up to 30 kilometers (18 miles) of rough terrain a day. Riders use stopwatches to pace themselves and GPS devices to find their way through the sandy plains, deep dunes, rocky hills and passes. The unforgiving terrain and fickle weather are not the only challenges: competitors must ride Barb stallions they have never met.Fifteen teams took part in the late February adventure, made up of 80 horse-lovers, enthusiasts of everything from trail riding to polo.On the first day itself, several riders fell off their horses and some gave up entirely -- while others said they were exhausted but enjoying the challenge. In case you are wondering – a stallion is a male horse that has not been gelded (castrated). Stallions have more muscular physique as compared to female horses, known as mares, and castrated males, called geldings.Temperament varies widely based on genetics, and training, but because of their instincts as herd animals, they may be prone to aggressive behaviour, particularly toward other stallions, and thus require careful management by knowledgeable handlers. The term "stallion" dates from the era of Henry VII, who passed a number of laws relating to the breeding and export of horses in an attempt to improve the British stock, under which it was forbidden to allow uncastrated male horses to be turned out in fields. "Stallion" is also used to refer to males of other equids, including zebras and donkeys. Contrary to popular myths, many stallions do not live with a harem of mares. Nor, in natural settings, do they fight each other to the death in competition for mares. Being social animals, stallions who are not able to find or win a harem of mares usually band together in stallions-only "bachelor" groups which are composed of stallions of all ages. Even with a band of mares, the stallion is not the leader of a herd, but defends and protects the herd from predators and other stallions. The leadership role in a herd is held by a mare, known colloquially as the "lead mare" or "boss mare." The mare determines the movement of the herd as it travels to obtain food, water, and shelter. She also determines the route the herd takes when fleeing from danger. Lot of care is taken in breeding horses, especially the race horses or those used for special purposes. A stud book also known as breed registry is maintained. The stud maintains data of animals within a specific breed whose parents are known. Animals are usually registered by their breeders when they are still young. Registries usually issue certificates for each recorded animal, called a pedigree. Registration papers may consist of a simple certificate or a listing of ancestors in the animal's background, sometimes with a chart showing the lineage. Studbook selection process allows a breed registry to direct the evolution of the breed towards the ideal by eliminating unhealthy or undesirable animals from the population. The removal of individuals from a population is called culling, and does not suggest killing the animal in question. Typically, culls are castrated or they and their offspring are unable to be registered. This also helps preventing inbreeding or diluting progeny. The pattern of studbook selection varies from nation to nation and registry to registry. Read that Stallions at the National Stud in Newmarket are subscribed to a matching tool - an equine dating system where the numbers are crunched to identify potential partners. "The tool will go back through the pedigrees and find successful horses that have been bred on the same cross, the same lineage," said the stud's marketing and nominations executive. "They will come up with the probability of producing a Group One winner, or what distance it might be best at. It will give you a 20-20 match, which is what you are looking for, but there will be lots of 20-20 matches that don't work. Sometimes it's just luck." Stud deals are normally signed on a no-foal-no-fee basis; hygiene is paramount - there are checks to guard against sexually-transmitted disease - and lots of paperwork. "Stallions have so much testosterone going through their veins that they are very territorial," said one who manages a stud. To them the stallions capable of reproduction are so valuable and they are keen to keep them in good stead. Reproduction is not exactly science, yet mankind tries to develop ways and methods to define and redefine it further. With regards – S. Sampathkumar 31st Mar 2018. 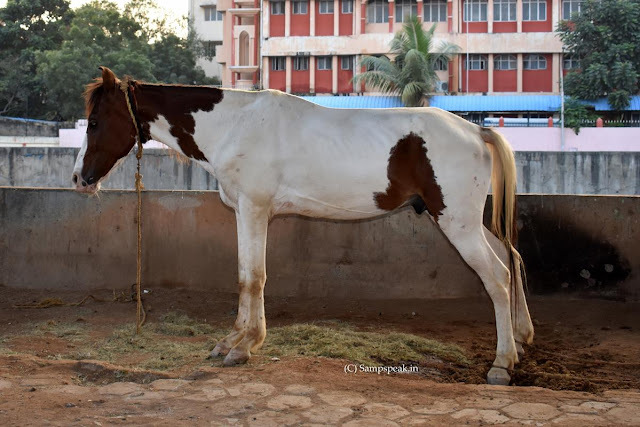 ~ the one pictured is of course not a pedigree stallion – a roadside click near Chepauk.